At the beginning of 1985 season just about everyone was convinced that Peugeot and Ari Vatanen would be the next champions, so impressive had both been in the selected outings team had had previous season. 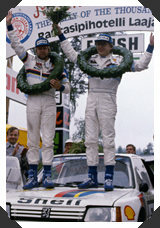 In fact, there were critics who did not understand Todt's decision to sign Timo Salonen at all. With two victories from two first events of the season for Vatanen the script looked like it was supposed to. But Salonen, who had to adjust to four-wheel drive and more extensive programme than he had been used to, gradually got the wind of things and begun driving better and better while Ari seemed to flounder. And so it was that by Argentina Timo was well ahead in championship points. After Ari's crash Salonen had virtually no opposition and biggest pressure was to ensure makes title for Peugeot. As if in a prelude to dramatic 1986 season, year 1985 witnessed the first top-line rally drive casualty when Attilio Bettega died in Corsica. Only little later in Argentina, Ari Vatanen was seriously injured in a crash. Serious safety concerns were raised but for a while still technology would have relatively free rule in World Rally Championship. During the year, two completely new cars and three evolution models were debuted by five different teams. Peugeot and Renault were first to give baptism of fire to their cars in Corsica, Peugeot 205 Turbo 16 E2 and Renault 5 Maxi Turbo. Audi's radical evolution of the quattro Sport, winged S1 debuted in Argentina. The two new cars went into action at the final rally of the year. Both were radical in their own ways but Lancia's Delta S4 was more successful, scoring 1-2 on debut. Austin Rover's MG Metro 6R4 came third so new cars fared pretty well. 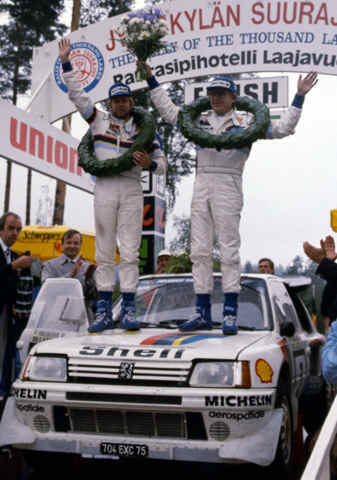 1985 FIA World Rally Champions, Timo Salonen and Peugeot.